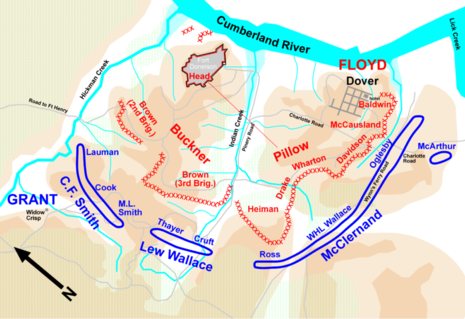 At 1:00 a.m. on February 14, Floyd held a council of war in his headquarters, the Dover Hotel, and there was general agreement that Fort Donelson was probably untenable. General Pillow was designated to lead a breakout attempt. Troops were moved behind the lines and the assault readied, but at the last minute a Union sharpshooter killed one of Pillow's aides. Pillow, normally quite aggressive in battle, was unnerved and announced that since their movement had been detected, the breakout had to be postponed. Floyd was furious at this change of plans, but by then it was too late in the day to proceed.